1903 Study by Henri Rinck. White plays and wins. Beautiful and more complex examples of the Enfilade technique. 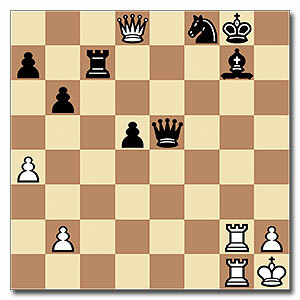 Here is a cool position played by Mikhail Tal as white in 1976. 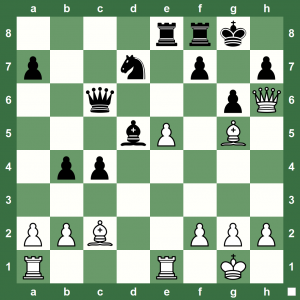 White has that nice pawn on g6, but what about it? 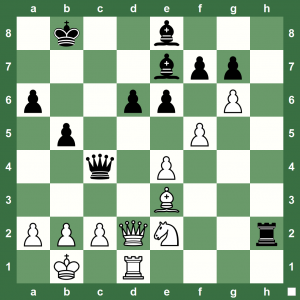 How did the legendary chess Grandmaster from Latvia handle this position? 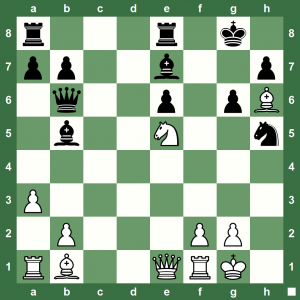 Easy Chess Study: White Checkmates in Two! A chess blitz game played on February 14, 2013, in Moscow, at the super strong Aeroflot Open Blitz Tournament. This is the second game of the mini-match between GM Ivan Bukavshin (Elo 2697) and the 12th women’s world chess champion chess queen Alexandra Kosteniuk (Elo 2581). Kosteniuk won the first game in the mini-match, this is the second game. After this game Kosteniuk will have a perfect 6 points after 6 rounds. 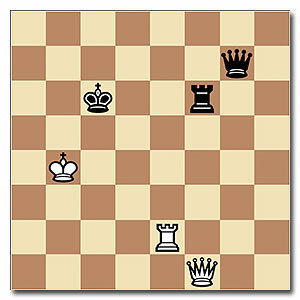 The game ends with a nice Queen fork, which is presented in slow motion. Read Alexandra’s post about this tournament at this link. 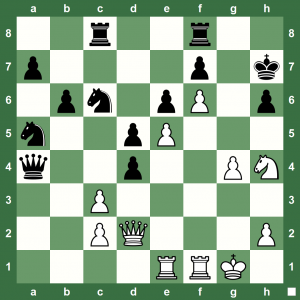 Retrogade-Analysis Chess Puzzle: On which square was the White Queen captured? A perfect example of Retrograde Analysis. On which square was the White Queen captured? This is a typical middlegame chess position where White just needs to get the Bishop or pawn on f6 to deliver checkmate via g7. Or, do you think clearing the diagonal b1-h7 could work? How to work that out? 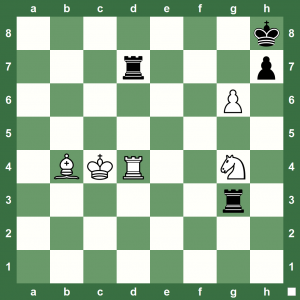 It’s an easy chess puzzle, can you win it for White? This position will check your chess killer instinct. Do you really keep track of your opponent’s weak spot and strike when required? White to play and win. Can you think like Garry Kasparov, the former World Chess Champion? 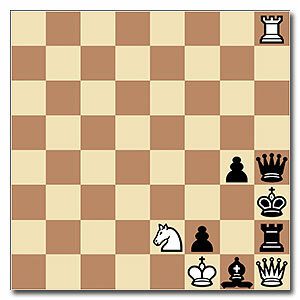 This position is from the game Kasparov – Begun Minsk, 1978. 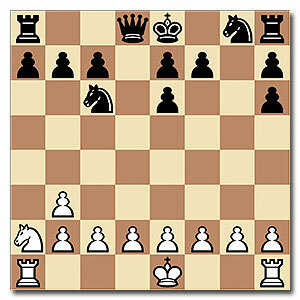 You can find all of Kasparov’s games in the Gigaking Chess Database. White to play and win. Try and work out as many lines as you can after you get the magic move! This position is from the game Rowson vs Mirjana Medic, Pula, 2002. White has a nice tactic worked out. Can you spot it? Here is a cool position from the game Laurent Fressinet vs Gerald Murcia, Calvia, 2013. White checkmates in two. You’ll feel good after you solve this 1898 miniature chess study by Troitzky. 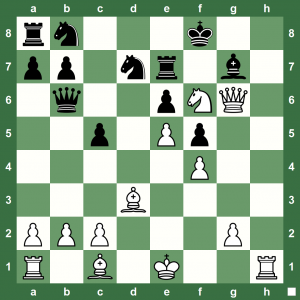 Troitzky Chess Study: Can White Win? Here is a pin-n-fork chess study by A Troitzky from 1923. 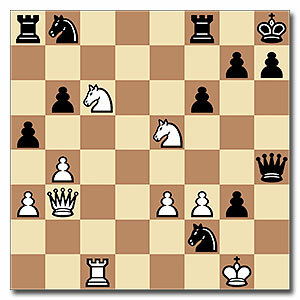 White is exchange down, but the Black King is holed up in the corner. 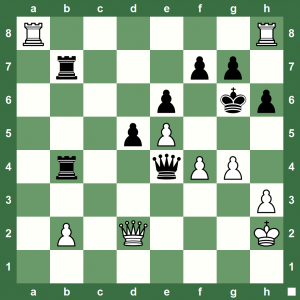 What tactical ideas can you use to help White win? 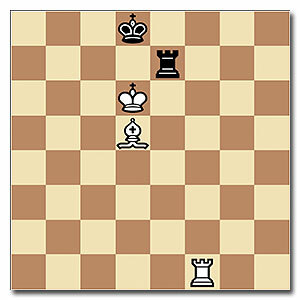 Here is a nice position from the game Bernstein vs Kotov, Groningen, 1946. 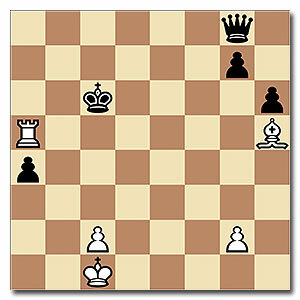 White came up with a very nice forced combination for a win. Can you spot it? Download FREE GigaKing Update to Chess King NOW!!! 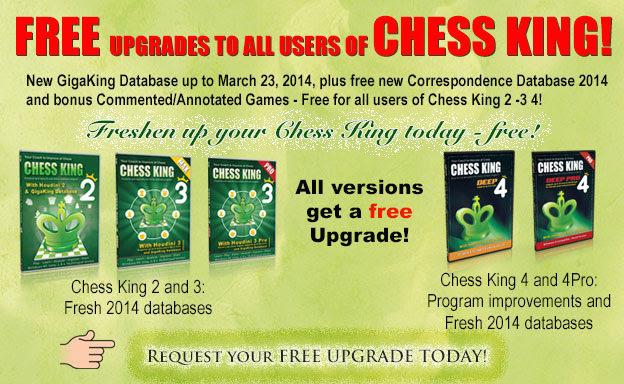 We’ve worked a lot recently on our Chess King software, and we’re glad to offer FREE GIGAKING UPGRADES for all registered owners of Chess King 2, Chess King 3, and Chess King 4 (all versions)! A chess blitz game played on February 14, 2013, in Moscow, at the super strong Aeroflot Open Blitz Tournament. This is the first game of the mini-match between GM Mikhail Kobalia (Elo 2636) and the 12th women’s world chess champion chess queen Alexandra Kosteniuk (Elo 2581). After this game Kosteniuk will have a perfect 7 points after 7 rounds. The middle game is very tense, and Kobalia seems to be ahead with a Rook and 3 pawns for two bishops. With seconds on the clock, Kosteniuk manages to make the bishops spring to life, and wins the game. Read Alexandra’s post about this tournament at ChessQueen.com. 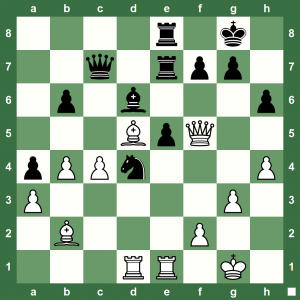 Geneva Chess Masters Video: A Pretty Combination! Watch the pretty chess combination played by the 12th women’s world chess champion and Chess Queen™ Alexandra Kosteniuk against French champion Romain Edouard at the Geneva Chess Masters. The game and combination are presented by Almira Skripchenko using the Chess King Pro Chess Software. 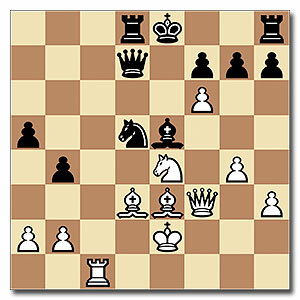 A key position from the game Aronian – Van Wely, Corus Wijk aan Zee 2008. White plays and wins.